With Eto'o staying at Everton for another season will he help Lukaku improve throughout the season and next season? 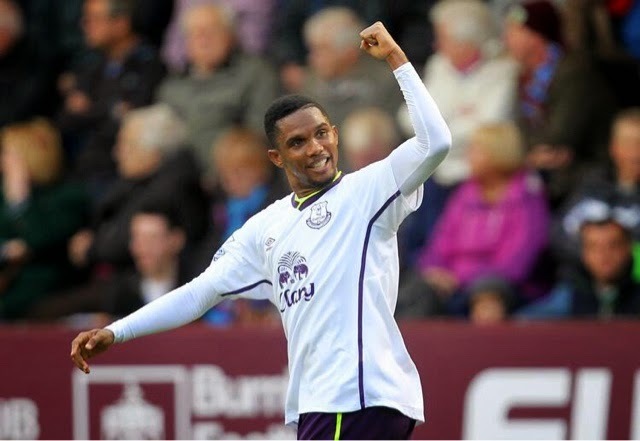 Eto'o agreed to stay at Everton another year after his terrific goal at Burnley and his chance that hit the post in the same game. The Everton Manager said " Eto'o's new contract will help us into the UEFA Champions League and get further than Arsenal, But to do that we tow top class strikers ". - Roberto Martinez. After Eto'o has left the club in two years who will be an Everton striker? Wilfred Bony would be and improving striker, but Martinez's choice and main target striker in the summer is Leicester Leonardo Ulloa. He is an Argentine who is proving critics wrong as he has made a move from Brighton to the Foxes to shock the other Barclays Premier League clubs. Wilfred Bony could be an Everton player.